EXCLUSIVE / The issue of Nord Stream 2 will be discussed at the 17-18 December EU summit, but the exchange is unlikely to go very far because the countries opposing the project use legal arguments which are not widely accepted, analysts told EURACTIV. At least seven countries from Central Europe have taken the position that Russia’s plans to double the capacity of its Nord Stream gas pipeline to Germany run counter to EU interests and risk further destabilizing Ukraine. The countries whose energy ministers signed a letter to the Commission in which they oppose Nord Stream 2 are Poland, Slovakia, Hungary, Latvia, Lithuania, Estonia and Romania. Greece has also reportedly joined the initiative. The issue of Nord Stream 2 will be discussed at the 17-18 December EU summit, as part of the discussion on the internal market, a source from the European Council confirmed. But leaders are unlikely to go very far, because the opinions how EU law should apply to the project differ greatly. Political arguments are expected to be used as well, but the easiest way to oppose the project is on legal grounds. Does EU law apply to EEZs? One school of thought believes that EU law applies only to the onshore part of the pipeline, on German territory, and that the offshore section is completely exempted from it. EU law requires third party access, meaning that half of the capacity of the infrastructure should be reserved to other potential players on the gas market. But another legal view is that EU law should also apply in the 200-km German economic zone, meaning the third party access should also be guaranteed there. “Different EU countries, different EU institutions and different experts have different views,” a Commission official who asked not to be named told EURACTIV. As he described it, the issue appears to be a particularly difficult one, with contradictory precedents and case-laws being cited, often with very valid arguments in both directions. The Commission is also reportedly discussing the issue with the Bundesnetzagentur, the German federal network agency for electricity and gas. Nord Stream plans further extension [see Nord Stream website]. But EU countries in the exclusive economic zones (EEZ) of which the new pipes are planned to be laid could deny their authorisation. Nord Stream 2 replicates the route of Nord Stream. According to the project’s website Nord Stream will have further extensions. Three main route corridor options are developed (see the attached map), which include several areas to be studied and optimised further. In particular in the Gulf of Finland and in the Baltic Proper there are three main route corridor options: through the Finnish EEZ to the Swedish EEZ; through the Estonian EEZ to the Swedish EEZ; through the Estonian EEZ to the Latvian EEZ and then to the Swedish EEZ. Only the Polish EEZ has not been envisaged as part of the routes. 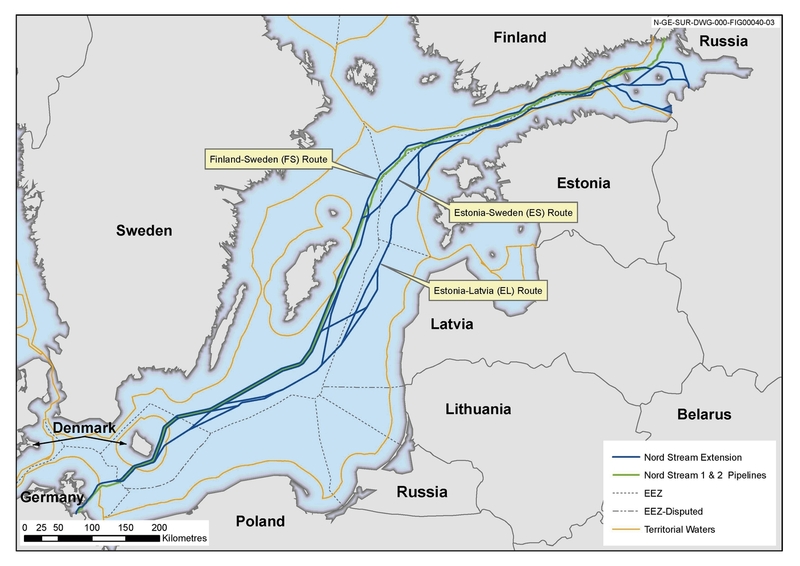 But either Estonia or Finland, either Latvia and Lithuania, or Sweden, could block the further extension of Nord Stream. Asked if this was not the easiest way to stop the extension of the project, the Commission official said “yes, you are absolutely right”. A third way to oppose the project could be to use the Commission’s anti-monopoly instruments, as with the completion of Nord Stream 2, Germany will receive 60% of its gas from Russia. The Central European Countries fear that Russia will scrap its biggest gas route via Ukraine, called the Ukrainian corridor, which carries roughly 140 billion of cubic metres of gas per year (bcm/y). As the gas demand in the EU diminishes, which is also due to alternative projects and the wider use of LNG, Russia could scrap also the Yamal pipeline, which brings its gas to Germany across Poland. Yamal carries 33 bcm/y. Reportedly the Western companies which are part of Nord Stream 2 (E.ON, BASF/Wintershall, OMV, ENGIE and Royal Dutch Shell) lobby against the EU’s LNG strategy, which is due to be announced in February. “They are quite strong companies, they talk to their governments, I’m sure Russia has offered them a very good deal,” the official said. Central and Eastern countries are frustrated, said the official, because they pay a high price for Russian gas, because with Nord Stream 2 they will lose their transit revenues, and because they would need new infrastructure to get the Russian gas from North (through Germany) rather than from East (through Ukraine). Another aspect that made the Commission worry was the loss of revenue for Ukraine from gas transit fees, to the tune of €2 billion per year. Thanks to reverse gas flows mainly from Slovakia, Ukraine has reportedly saved €3 billion, as price difference between what it normally should pay to Gazprom and the cost of the reversed gas. But the biggest worry was for Ukraine’s future. “Once you don’t transit the gas there will be nothing to reverse”, the official said. He added: And where are we going to find those €5 billion to keep Ukraine afloat?